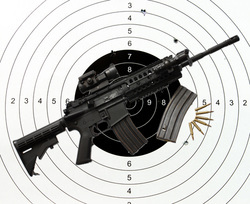 High power rifle shooting uses center-fire ammunition of any caliber. The most common high power rifle shooting uses military rifles such as the AR-15, Garand, M-1 Carbine, M-1A, and 1917 Enfield, and Mausers. Year round 9:00am to sunset. The kitchen will be open for breakfast! High power rifle, ammo, eye and ear protection. Spotting scope & shooting accessories are helpful. Sanctioned events are open to the public.